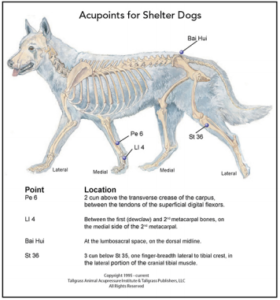 Editor’s Note: This article has been sourced via Tallgrass Animal Acupressure Institute. Animal shelters are tough places no matter how hard staff and volunteers work to make them comfortable. Being in a shelter is terribly disorienting for a dog or cat, and in their confusion and fear, they may act out or retreat into themselves. Acupressure-massage is one way to offer these animals emotional and physical comfort and care until they are adopted into their forever homes. If you work or volunteer at an animal shelter, or want to try this technique on a newly-adopted dog or cat or other fearful and disoriented animal, be sure to start with ourself. Working at a shelter is stressful, but you have to be present, calm, and thinking about what you want the dog or cat to experience during the session. For example, you could set an intention that the session will be loving, comforting and calming; every animal in a shelter needs this, no matter what. To being, the acupoint referred to as Large Intestine (LI4) can help you calm and center yourself. Located in the webbing between your thumb and forefinger, this point is known to help release pressure in the face, mouth, and head. It’s used to mitigate migraines, dental pain, and feelings of stress, and to promote a sense of calm. 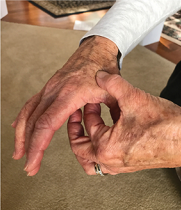 Hold the webbing between the thumb and forefinger of one hand between the thumb and pointer finger of the opposite hand, with the thumb on top and the finger below the webbing. While holding that point, think about what you want the animal to receive during his or her session. Slowly take three deep breaths. Then change hands and repeat the procedure. Once you feel present and focused, you are ready to begin the session. Animals know immediately when you are thinking about something else, like what you need to buy at the store on your way home. The session will be much more effective if you are grounded, caring, and present. Start by using the heel of your hand to slowly stroke down the animal’s body just to the side of his midline and spine from head to hind paw, following the Bladder Meridian Chart. Trace the meridian three times on each side of the animal’s body. This tells the bod or cat you are doing something other than petting him. Your intention is to be comforting and help him feel calm. 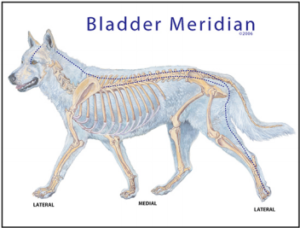 Once you have completed tracing the Bladder Meridian three times on each side of the animal’s body, you are ready to offer specific acupressure points to help restore a feeling of well-being (see charts below for the names and locations of these points). 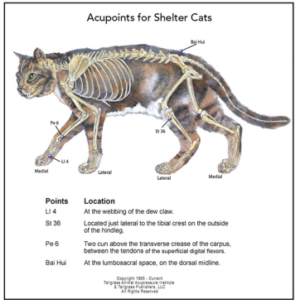 The acupressure points selected for animals in a shelter environment support general health, reduce fear, boost the spirit, and promote a sense of courage and well-being. While performing acupressure point work. always have both hands on the animal at the same time. One hand is doing the point work while the other rests gently and comfortably somewhere on the dog or cat’s body. The resting hand can feel any reactions the animal has to the point work, while offering grounding and comfort. If you are unfamiliar with acupressure, you need to know that there are two basic techniques for stimulating acupoints – the Thumb Technique and the Two-Finger Technique. Both are considered direct pressure techniques, called an An Fa in Chinese. There’s no need to press hard because the meridians and acupoints are just beneath the surface of the skin. In fact, gentler is better, so you won’t obstruct the flow of chi. Thumb Technique works best on larger dogs and on a medium-sized dog’s trunk, neck, and larger muscle masses. Two-Finger Technique – Place your middle finger on top of your index finger to create a little tent. Then lightly put the soft tip of your index finger on the acupoint and count slowly to 20. This technique is good for point work on small dogs or cats, and for the lower extremities on medium-sized to large dogs. When you have completed the point work, trace the Bladder Meridian three times on each side of the animal just as you did at the beginning of the session. This gives the acupressure-massage session a finishing touch; it’s like smoothing a bedspread and tidying up the energy.